“How was school today?” My standard question was met with my son’s standard answer. I could tell by his tone it had been less than fine. I'm not sure her son had ever painted his nails but I love that she stepped in to clarify that nail polish was not necessarily gender specific. He wore it several more times and by the time he got to 4th or 5th grade he was just the kid who sometimes wore nail polish. No big deal. 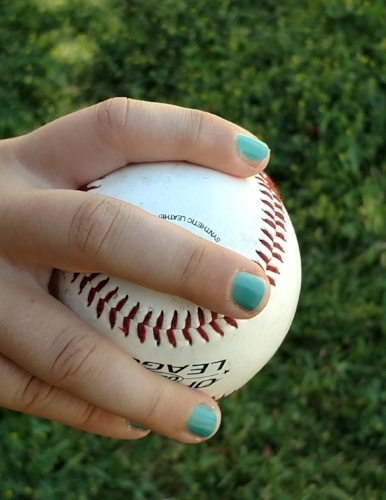 It had all started because he saw professional Major League Baseball catchers wearing nail polish so the pitchers could easily see their signals. Granted, there was not a lot of pitch calling at his level of Little League, it was all they could do to get the ball near the plate. Regardless, he was all in as a catcher and nails needed to be painted, preferably in team colors. Of course Elementary School is a safer space and I wasn’t sure how painted nails would go over knowing the shark tank that is Middle School. I hated to squelch his enthusiasm by pointing out that kids might make fun of him, after all he had always marched to his own drummer. This was the kid who brought the house down with his 1st grade talent show rendition of Gangnam Style and then wrapped up 5th grade by playing Uptown Funk on the clarinet. It was crushing to see him so sad. He had skipped off to school so happy and I think he was just hurt that something so normal to him would be called out. Discovering that nail polish was cause for ridicule was an unexpected blow to his joyful soul. The whole incident brought up a long conversation in the car about standing out or blending in. His older brother was of the opinion that the least you do to stand out the better, especially in Middle School. I countered that being unique and being different is a good thing and having your own style and sense of self is important in life. I could tell he was still sad when we got home and he managed to hold it in until I sat next to him on the couch and gave him a big hug. He leaned in and let out his frustrations with a big sniffle and renewed tears while I continued my mom pep talk. Not sure if my long dissertation made a difference or if he’d just gotten bored and moved on. Sometimes the best parenting approach is to impart your wisdom long enough for them to forget why they were upset in the first place. He may not have said anything at the time but his actions spoke louder than words the next morning as he headed out the door with nails still polished. I hope he continues to follow his own path and I’ll look forward to seeing his hand signals clearly when he’s a major league catcher.